Hi. I'm keisel, named after brett keisel of the pittsburgh steelers. I'm still a puppy, and am going to be 9 months old on the 20th of sept. I live in santaquin, utah with 4 other cats I love to chase, I mean "play" with. I'm exited to see if I win this contest!! Thank you for having this web site for my humans', I know they will get a lot of great info from it! Comments for I'm German Shepherd Keisel and I'm a Steelers Fan! 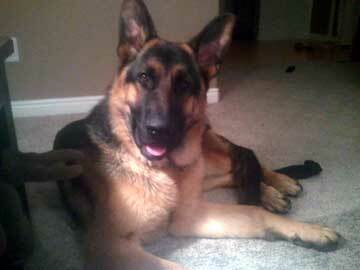 What a Handsome German Shepherd, he is a "Romeo", I bet all the girls will be chasing him! I can't believe he is only 9 months old, when he is fully grown, WOW! Keisel looks very confident and healthy. You have my vote. I wish he could meet my MIA, they could play together, she will 2 on November 10. Read our story german shepherd puppy mia's story and Mia my beautiful german shepherd dog on this website. Take care of your boy and he will take care of you!